Another accepted definition is the killing of someone as a political act. I think anyone would be hard-pressed to argue that the death of the Romanovs was not a political act. Even the grand duchesses had political significance to both the Whites and the Reds, despite their lack of political power. Quick question, I haven't read this book yet. I would like to know if the content is similar to Fate of the Romanovs (regarding the days the IF remained in captivity and the murders) or if it includes new information. I'm aware the authors reach different conclusions, but I'm curious about the facts, or historical accounts. It's been quite a while since I read either book, but if memory serves, Resurrection's account of the captivity and murders is basically an abridged version of FOTR's. I don't recall any new information being presented. I merged your question with a previous thread on the same topic. Please remember to use the search function. Tsarevich Alexei Nicholaievich / Re: How Much Longer? Nicholas and Alexandra's diaries also attribute Aleksei's last bout with hemophilia to a cough. (Though I don't think it was whooping cough specifically.) Neither of them mention the sledding incident as a probable cause. If you hunt around here you'll find a lengthier discussion with dates and excerpts from various sources. I believe that the full text of this letter appears somewhere here on the AP Forum, but I cannot find it right now. Eva and Daniel McDonald translated it from Princess Eugenie's book. "...To remind you of Golaf. Sem., I can inform you that today we ate the provisions purchased on Saturday. Sedniev heated everything again on the spirit stove, and this reminds us how he prepared our kasha." Does anyone have any idea who or what or where Golaf. Sem. might be? Perhaps it's a place in the Finnish Skerries where the Imperial family used to picnic, etc? Or the Crimea? I congratulate you, my dear for Mama’s birthday. Today I’m writing with new ink – it’s better, isn’t it? I am writing at 10:45, which is to say it’s 11:45 at your house. You will probably have the changing of the guard. At our house the guard changes only every forty-eight hours. The deputy commander told us yesterday how as a boy, he lived in Gagra and played with A[unt] Olga. He also met U[ncle] Misha when hunting, in short told us many interesting things about his life. After dinner, we spend the evening with Evg[eny] Serg[eivich Botkin]. Niouta greets you all, it reminds me of Aleksei when she says: "Oh Come on!" or "You see what is going on!" She repeats that very often. Currently, the sun shines and it snows. To remind you of Golaf. Sem. I will tell you that today we eat the supplies we purchased last Saturday. Sedniev reheats everything on our alcohol stove, and reminded us how people used to prepare Kasha for us. The dining room is dark, with a buffet on which our hats and our provisions are placed. The door that leads to the balcony is closed with shutters that are padlocked, and the window is blocked from the outside with a carpet. Niouta spends her mornings cleaning the rooms, there is a lot of dust -- where it comes from is a mystery since there is no carpet. In our rooms there is linoleum, and in the living room and the dining room there are parquet floors. Remind Al Petr. Kirpitchnikov to bring some radish seeds. Is Fizi crying because he will need to pack everything again? I am always wondering what you all are doing, how you pass the time. Is Tolia coming to play? My dear sweet dushki, thank you very much for the four-leaf clover. I was very moved and am wearing it today. Perhaps you have a church service today, it would be so nice! I do not write to each of you separately because there is nothing interesting to say, my head hurts. Papa reads to us in a loud voice a lot. I remain in bed with my eyes closed and Maria is drawing. This time, this letter is for Aleksei. Oh! How I would like to see you. The days are passing and we don’t know anything about what’s going on with you. We do not write to the others, since you probably tell them all about us. We greet them all. As for you, our beloved, we embrace you tenderly, tenderly and bless you. May Christ be with you. Your old and very loving Mama. This page has been soiled by the road, in fact, all our paper is dirty. Mama hopes that you received the eggs and icons yesterday. We learned that Al[exis] walked in the courtyard and we are very happy about it. Papa and I embrace you very tenderly. May Christ be with you. Your M.
It's Olga — easier to see in the full-size version here. Yes, that's one way to put it — it's a shortened version, combining information from both volumes. If your primary interest is in Nicholas II, I recommend purchasing only the second volume of the original set. If you have a broader interest in Russian history, this abridgment is a satisfying alternative to the expense of the complete set. 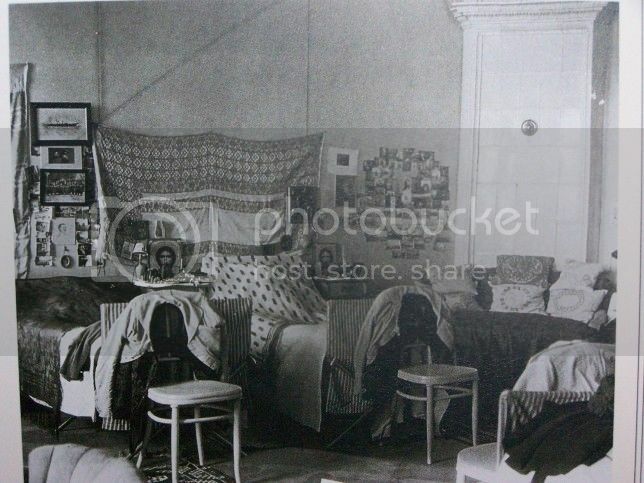 This photo shows Anastasia and Maria's beds against the wall, and the footboard of Tatiana's bed in the lower right corner. Olga's is further to the right, outside of the frame. I own only volume 2 — I've never read volume 1. So yes, volume 2 works just fine on its own. If you're interested in volume 1, let me know. I'll send you a couple links where it's available for under $200. Where did you read that there were photos taken in the Ipatieve house? I read that the Romanov's asked to 'play' with their Box brownies at Ekaterinburg but were refused them. It may be an assumption, based on the finding of burnt film rolls in the Ipatiev stove following the murder. I believe Alexandra also used the Fohn apparatus for relief of her sciatica. This is so intriguing — I wish I could see it in person! I love the books, and the life-size photos. Nicholas II / Re: Did Nicholas lift weights? He had a chin-up bar in his bathroom at the Alexander Palace. He took it with him into exile.